This is probably one of my favourite Korean meals and it originated from a recipe for o-geo-chi kalbi doen-chang guk (우거지 갈비 된장국). It is very versatile and I often eat if for breakfast but with a larger portion, rice and side dishes it becomes a filling dinner. O-geo-chi is basically the outer leaves of cabbage (Napa/Chinese) or any other vegetables. I have found Koreans tend to be quite rule bound when it comes to cooking and I have even be critcised for putting pepper in food. Indeed, a number of Korean women have found the idea of combining bean paste and red pepper paste strange even though I originally found this recipe in a Korean-Korean cookbook. You can use pork, especially belly pork (cut sam-kyeop style – that is the same cut as bacon before it is turned into bacon) or simply tofu. 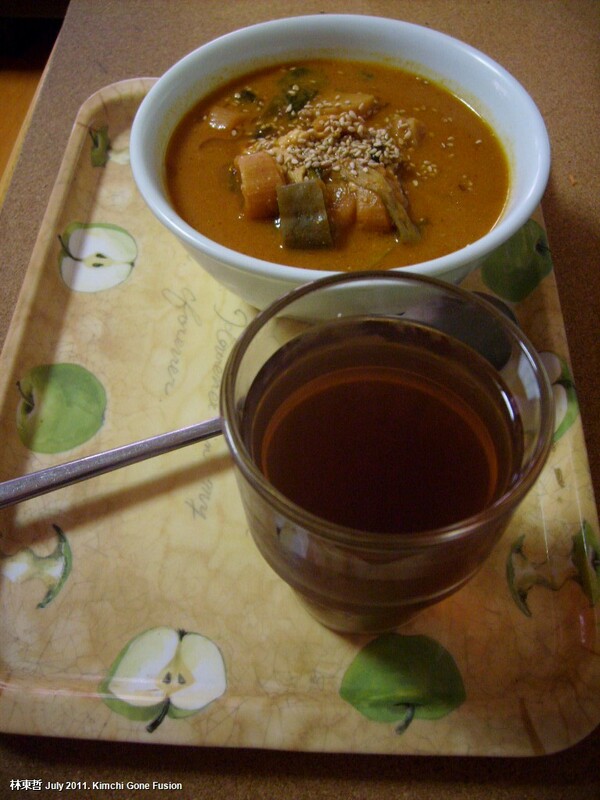 I have used numerous vegetables and sometimes even made it without o-geo-chi. I recently added some black beans at the same time I was making black bean tea (까만콩 자) and was reminded of German bean soup. •a handful of any chopped vegetables, carrot, potato, leek, onion, mushroom, etc. •small piece of chopped ginger. 1. Put everything, except the sesame seeds into a pot, bring to boil and then simmer for up to 30 mins depending on the type of meat, if any, you are using. 2. Remove from heat, add salt and pepper to taste and if you wish a teaspoon of extra sesame oil (sometimes I don’t add any oil until this stage). Finally, sprinkle with some sesame seeds. This stew can be eaten alone or with rice and side dishes.